The Minnesota Timberwolves have finally traded Jimmy Butler sending him Along Justin Patton to the Philadelphia 76ers for Robert Covington, Dario Saric, Jerryd Bayless and a 2022 second round pick. Butler will form a big three with Joel Embiid and Ben Simmons and it’s going to be interesting to see how these players, fit, grow and develop with one another. Although these three players will likely develop a nice chemistry together the odd man out in all of this will be Markelle Fultz as his time with Philadelphia is now in all likelihood doomed. Not only because Butler is likely to sign a five-year max deal this offseason with the Sixers and it looks like he is set to be in Philadelphia for the long run. But because the departure of Covington and Saric (two of the best shooters in their starting lineup) will force the Sixers to replace them with guys who can shoot and as a result, they could decide to try out a new-look rotation that would limit Fultz’s minutes. The Sixers could opt to use Simmons, J.J. Reddick, Butler, Wilson Chandler, and Embiid as this lineup would help the Sixers replace the shooting assets that they lost in Covington and Saric. Once on the bench Fultz, a 2017 first-round draft pick, would be limited to about 20 or 25 minutes per game, and that would simply not be a role big enough for him to grow and reach his full potential. The Sixers could opt to keep him in the starting lineup, but that would harm their shooting numbers too much, as he’s struggling offensively, and they need to replace Covington and Saric’s lost production. Because of that Fultz is starting to look like a player without a role in the Sixers’ rotation. If Fultz comes off the bench, he would only play about 12 minutes as the main ball-handler when Simmons is out and the rest of the minutes, he would have to play them off the ball and that is something he’s currently struggling with. Becoming a sixth-man type of player is unlikely to fit Fultz as he’s more likely to struggle if he starts to see limited minutes that would cut short his development. 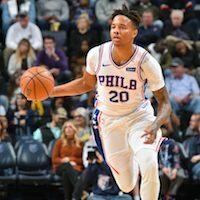 Fultz has the skills and the athleticism needed to be a great shooter and defender who can play both guard positions and could potentially one day become a 20-point scorer, but for that he needs to be the main ball handler on his team, and that is unlikely to happen in Philly as that role is reserved for Simmons. Fultz needs a new change of scenery to truly reach his potential and that means the Sixers should consider trading him and listening to offers from teams interested in his services as that would also benefit them in the long run.